Just a few miles south of Lambertville lies an area ripe for weekend adventure and exploration. Components of local, national, and natural history are well represented, as well as brilliant prospects for craft seekers, hikers, mountain bikers, horseback riders, and picnickers. To get there, head south from Lambertville on Route 29, enjoying glimpses of the Delaware & Raritan Canal feeder and the Delaware River along the way. A couple of miles down Route 29, you will soon pass by the county workhouse, Bald Pate Mountain, the village of Titusville, and finally arrive at Washington Crossing State Park. Established in 1912, the 800-acre park commemorates one of our nation's most important early historical events. On Christmas night in 1776, after pushing off their Durham boats from the Pennsylvania shoreline and crossing the ice-laden Delaware River in the dark, General George Washington and 2400 Continental Army troops landed on the river's New Jersey bank. Upon regrouping, they marched nine miles south to Trenton to defeat surprised Hessian troops who lay sleeping off the effects of a late night celebration. Washington's troops gained a much needed morale boost that would carry the nation to eventual victory over the British army. History buffs will enjoy visiting the Nelson House, located at the spot along the Delaware where Washington's troops landed. Inside, visitors may view period furnishings plus vintage photos of the neighboring railroad and canal. Not far from the river is the 18th-century Johnson Ferry House, where living history demonstrations are occasionally presented to the public. Evidence hints that George Washington and his staff used this house to discuss their final plans for the Continental Army's march to Trenton on that fateful Christmas night. 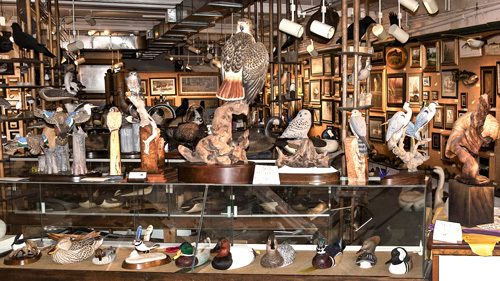 The Visitor Center Museum contains exhibits of Revolutionary War artifacts and documents with emphasis on the "Ten Crucial Days" which began with Washington's crossing, and include the Battles of Trenton and Princeton. 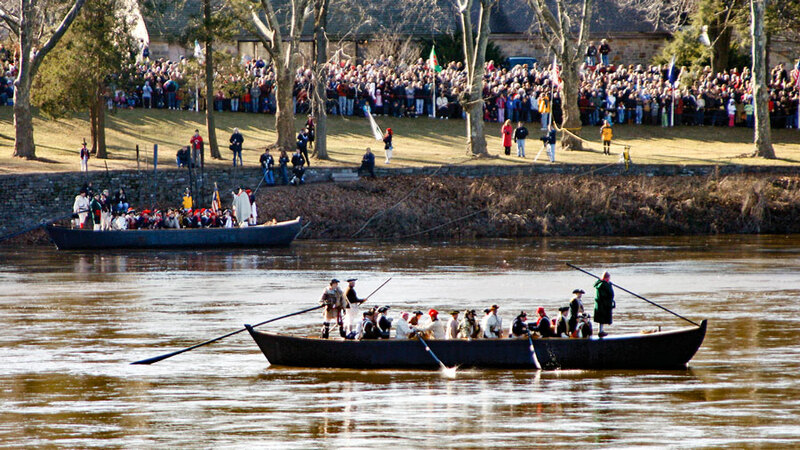 One of the most widely attended events offered at the park is the annual Christmas Day reenactment of the crossing of the Delaware. Unlike the original, which occurred in frigid weather through life-threatening ice floes during the dark of night, the daylight reenactments are dependent on weather and water conditions, so check first if you plan to attend. Nature and outdoors enthusiasts will want to visit the park's 140-acre Natural Area and its associated Interpretive Center, which offers outdoor, and nature programs throughout the year. From the Interpretive Center, nature trails lead through fields and woods and pass by an observation blind from which observers might catch glimpses of birds, deer, and other wildlife. Since some birds spend the winter here, bird watching can be good here year round. An astronomical observatory is located near the Interpretive Center. Operated by the Amateur Astronomical Association of Princeton, Friday night sessions are offered. To find out more, call (609) 737-2575 or check their website . Trails for hikers, bikers, and cross-country skiers cover 15 miles within the park although the park's website should be checked for any restrictions. Also, near the river, there is a hiking & biking trail along the Delaware & Raritan Canal feeder where anglers will be able to fish for sunfish, bass, and pickerel. Cultural enthusiasts will want to attend summertime concerts and performances at the park's Open Air Theatre. Operated by the Washington Crossing Association of New Jersey from June through August, events take place on an open outdoor stage. For more information, call (609) 737-1826. Details, directions, and other park information may be found at the park's website. While Washington Crossing State Park celebrates events that affected the whole of American history, other nearby sites illuminate vital aspects of local heritage. Retracing your route, head back up Route 29 about 4 1/2 miles to Valley Road (about 2 1/2 miles south of Lambertville) and turn onto it, following it about 1 1/2miles to Woodens Lane. Turn left and go another 1/4 mile to the entrance lane on the right leading to the Howell Living History Farm. You are in the Pleasant Valley Historic District. The Pleasant Valley Historic District is a small area that holds more than a dozen locally historic sites, one of which is the Howell Living History Farm. 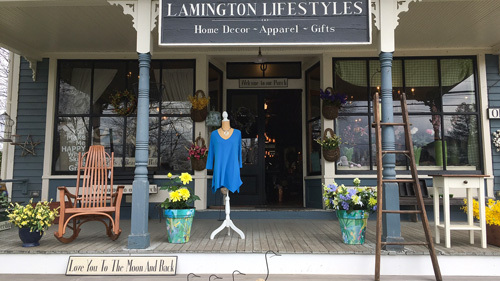 Within this District are also at least two other farmsteads, two old public school sites, the Phillips gristmill, a blacksmith shop site & house, the old Phillips Burying Ground and more. These sites may be visited on horse-drawn wagon tours originating at the Howell Living History Farm. The farm is owned by Mercer County and is operated by the Mercer County Park Commission in assistance with The Friends of Howell Living History Farm. The operating farm is open to the public, serving as an educational facility whose purpose is the preservation and interpretation of turn-of-the-century farm life. Offering a widely diverse seasonal schedule, visitors can return time and again, experiencing something different each time. Some of the many seasonal demonstrations that can be seen here are ice harvesting, sugar tree tapping and maple sugaring, lambing and sheep shearing, beekeeping, potato and corn planting, haying and wheat harvesting, honey collecting, and potato harvesting. Other scheduled events are wagon tours, hayrides, ice cream parties, workhorse rides, and even an old-time baseball game. To locate the Howell Farm entrance with a GPS device use: 70 Wooden's Lane, Lambertville, New Jersey. For a wealth of information about this facility, for their schedule, or for more historical information about Pleasant Valley, check online. online. 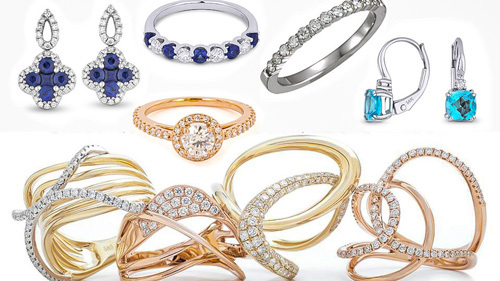 Other contact information as given on their website is by phone (609) 737-3299, or by email . While both Washington Crossing Park and the Howell Living History Farm illuminate and preserve the area's past, a new Mercer County park located between them shrouds most of its historical mysteries, while providing opportunities for outdoor activities. The Ted Stiles Preserve at Bald Pate Mountain is named in honor of the man who led a 9-year campaign to make the park a reality. Stiles, recently deceased, was a resident of Hopewell Township and a long-time professor of biological sciences at Rutgers University is also credited with the preservation of more than 9,000 acres other natural lands in New Jersey. Bald Pate Mountain's peak is Mercer County's highest point, about 470 feet above sea level. On clear days Philadelphia is within sight, as is the Delaware River below. The park contains more than a thousand acres, and, although some sections are still in the formative process, over ten miles of unpaved trails, marked and unmarked, are currently open for hikers, bikers, equestrians, and hunters during the season. While some of the trails, such as the mountaintop Ridge Trail are reasonably level, many others are sometimes steep. A few trails have picturesque steep stone steps that require some degree of caution to negotiate. Within the park, birdwatchers may find a large number of neotropical migratory songbirds. Bald Pate is possibly the only location in Mercer County with breeding pairs of Kentucky hooded and worming-eating warblers. The origin of Bald Pate's name is one of the park's mysteries. Until the mid-20th century, the mountain was known locally as Kuser Mountain, named for the family who owned it for many decades. In Henry C. Beck's 1939 book Fare to Midlands, reference is made to the top of the mountain having been cleared by one of the Kusers, perhaps for a landing strip. Possibly the bare mountaintop suggested the more recent name of Bald Pate. At the summit, the Kuser estate, called "Strawberry Hill", included a main house, lodge, and various outbuildings. For a few years in the early 1900s the family established a game farm on the mountain, raising pheasants with the assistance of an experienced gamekeeper and other local workers. In 1986 the family sold the property to Trap Rock Industries, and in 1998 Bald Pate Mountain was acquired from TPI by Mercer County. Two large parking areas have been constructed in the park, one at the base of the mountain on Fiddlers Creek Road alongside Kuser's former lane to the top, where a visitor center complex incorporates the original structures at Strawberry Hill. Eventually the lane will be improved, allowing for limited vehicular and handicapped access to the top of the mountain. A "smart gate" located at the lane's entrance will remain closed when the small parking area at the mountaintop visitor's center is full. Access to the top by foot will not be limited. It is expected that public groups and organizations will also be able to use these mountaintop facilities for various meetings and gatherings. Although Bald Pate Preserve's present day trails pass through woods that seem to have always been there, that was not always the case, especially in the eastern portion of the park, known for many years as Honey Hollow. If Henry C. Beck had not explored Honey Hollow in the 1930s, talked to the "locals", and then recorded his adventures in Fare To Midlands, there is little chance that anyone today would have any knowledge of the settlement that once existed here and up the sides of Bald Pate. A check of U.S. Census records shows that well over a dozen families lived in the area for many decades, some for two or three generations. Old newspaper articles and ads give scant hints of their lives, both socially and in business. Among the trees, protected by the thorny multiflora roses that have taken over as the predominant undergrowth, are remnants of a fairly large settlement of long forgotten farmersÉ and maybe even a bootlegger or two. The most obvious vestiges of the former inhabitants and their labors are the prominent stone rows that run along, and sometimes cut across, the park trails. Before early farmers could plow and seed the earth they first needed to clear this very rocky hillside to make usable fields. Removing rocks was an ongoing process, as frost heaving brought a new crop to the surface each winter. Each year, the farmers dumped the rocks along the edges of their fields, defining their properties' boundaries and the lanes that ran from one farm to another. Also scattered throughout the area are rock caches, some of them large enough and stacked neatly enough to suggest that you are looking at the ruins of a house; or maybe ancient waypoint markers for alien invaders. These collections however, like hundreds of others found throughout the northeastern U.S., were simply intended to be used for future construction of homes and barns; structures that never came to be. As the fields were abandoned and natural progression took over, corn, hay, and wheat were replaced by cedars, and then maples, elms, and other hardwoods that rise above the prickly invasion of the multiflora rose. 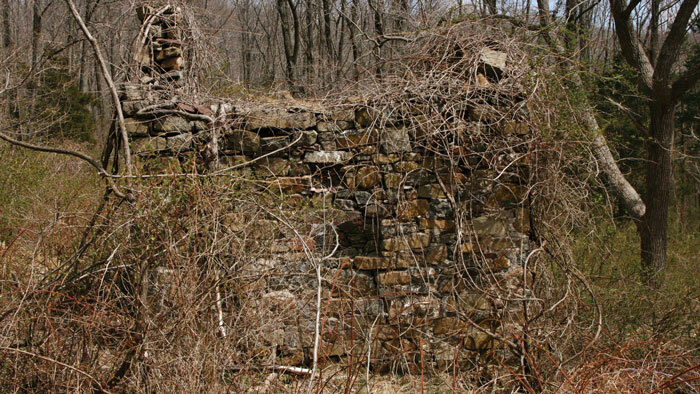 Scattered throughout, begging to be discovered, are the remains of more than a dozen structures, mainly ruins of houses, barns, and springhouses and the faint old lanes that once connected them. All that remain of the old houses, probably constructed by local stonemasons or even the farmers themselves, are foundations and cellar holes, or nondescript heaps of rocks where they tumbled. Another mystery is reflected in the name of one of the park's trails, the Copper Hill Trail. Local legend hints at the existence of a long-lost copper mine, its workings attributed—probably incorrectly—to the labors of Indians. Somewhere here on the mountain the mine does, or did, exist. Beck visited the small mine, and in his book included a photo of its entrance. A chimney rises alongside the Copper Hill Trail. 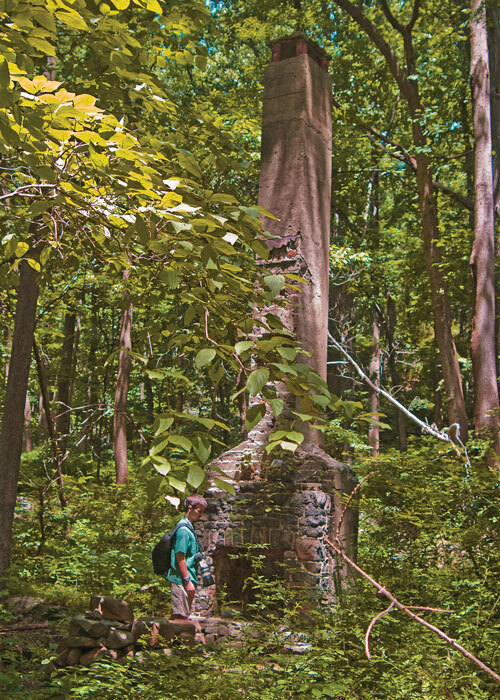 Along the Copper Hill Trail, despite having an uncanny knack of remaining hidden in plain sight a few feet off the trail, hikers and bikers suddenly notice a fireplace and chimney rising in the woods. But who has taken the time to notice the strange construction of the adjacent cellar hole? Could it be that bootleggers really did change this place to make illicit Prohibition products as claimed by Beck? Or way off the established trails, who built that old springhouse that has "DHP Aug 1845" inscribed in its mortar? The springhouse is obvious as is the large ruined cellar hole beside it, but where was the barn? Nature's progression is bent on concealing forever all that once existed here, as it has done in the rest of the Hollow. Here at Bald Pate questions arise that beg to be answered. Who were those former inhabitants of Honey Hollow? How many of them were here? Why did they leave? What happened to their homes? Possibly, as time goes by, more answers will surface but for now, as you use the trails of Bald Pate, remember that this wasn't always "just woods." 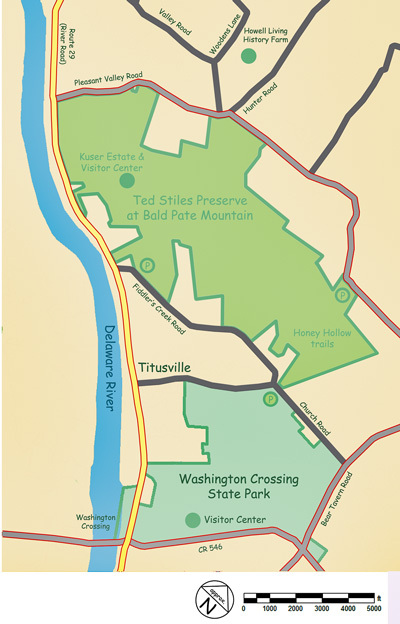 To find access to the Ted Stiles Preserve at Bald Pate Mountain, drive up either Pleasant Valley Road or Fiddler's Creek Road, looking for any entrances or parking areas. Until construction is completed at the park the access entrances and parking areas will vary. Large portions of the park are closed to non-hunters during certain days of hunting season from mid-November to February. Check the Mercer County website for schedules during that period. Or call (609) 989-6532. Friends of Hopewell Valley Open Space is also helpful.